Processing center capable of handling 95% of the products offered in the marketplace. Established in 1997, and acquired by Robindale Energy & Associated Companies in early 2018, Centennial Steel is a toll processing and storage facility. The facility boasts a handling capacity to suit 95% of the products offered on the market place. Centennial Steel is able to toll process and store for captive and 3rd party customer materials. Centennial Steel Processing is located within the City of Gary, which resides within Lake County and is located approximately 25 miles southeast from the Chicago Loop. 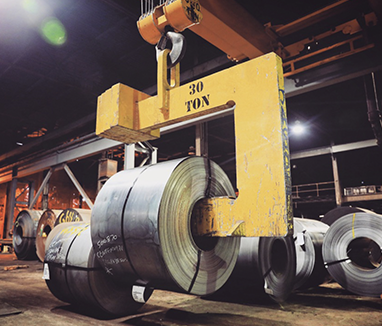 Centennial Steel is able to process steel in-house with our slitting and leveling machines. Our steel slitting process uses rotary knives to cut wide coils of steel into narrower cuts or smaller steel coils according to the customer specification requirements. The precision in our steel slitting process prevents waste in the process. Our corrective leveler uses adjustable pressure points called flights, under the rolls to raise and lower them to an exact position. By adjusting a work roll’s shape, the material’s path length can be altered through the leveler. A longer path length allows the material to be stretched more because more work is being performed on it as it passes through the rolls. The facility also has a full-service, climate-controlled, ISO 9001:2008 certification (pending) warehouse with over 200,000 sq. ft. of storage as well as partnerships with strategic warehouses around the world.